Animal Pros Certified Bird Control specialists offer immediate assistance for all bird control issues in greater Nashville, Franklin, Brentwood, and Middle Tennessee. Common problem birds include starlings, pigeons, sparrows, vultures, gulls, swallows, geese, and hawks. Bird problems on your rooftop, ledges, or warehouse of your business? You have came to the right place. Bird roosting, nesting, & sheltering sites can create a huge problem & even become a health & safety Issue. Once roosting sites are established, these creatures of habit will continually return. Animal Pros offers bird netting and bird spike installation to control bird problems for good. Birds can create a huge mess of droppings & nesting that can hold bacteria & pathogens, as there are several human communicable diseases associated with bird droppings. As the birds continually move over droppings, particulates can become airborne. This can be a issue if roosting next to a ventilation system on a roof, or directly overhead of a public walkway. Bird droppings are so highly corrosive, we have even seen them eat through metals. Our bird control step-by-step solutions will effectively solve bird problems permanently. We specialize in birds and wildlife. Birds in the exhaust or bathroom vent. Birds in the dryer vent. Bird droppings on the roof. Birds in a horse barn. Commercial bird dropping removal services. Animal Pros offers residential and commercial bird control services for homeowners, businesses, property managers, airports, and government. We are fully licensed and insured, Bird Barrier Certified, multi state certified, aerial lift certified, and experts when it comes to all aviary species. Bird Control services are offered in greater Nashville and Middle Tennessee area wide including: Franklin, Brentwood, Hendersonville, Columbia, Spring Hill, Thompson’s Station, Hermitae, Antioch, Goodlettsville, Springfield, White House, Lebanon, Portland, Mt. Juliet, Gallatin, and Fairview. There are a number of different ways of performing Nashville bird removal. A bird control expert can help you with the best method or getting birds out of your home. We can help you with bird removal and relocation. We can also perform bird exclusion, which will prevent birds from being able to gain access to your home again. Bird exclusion is one of the best ways of preventing any future bird problems in your home or business. Commercial bird netting is the best solution for bird control in greater Nashville, Franklin, Brentwood, and Middle Tennessee. Bird netting is discrete, and effectively closes off access to birds, stopping bird problems for good. Bird netting is the best solution for warehouses, open-air overhangs, parking garages, military or airport hangars, awnings, and trucking bays. Animal Pros specialists are Bird Barrier Certified Installers and have extensive experience in bird netting solutions and other available deterrents. Bird spikes, is one of the most cost effective bird control option in greater Nashville and Middle Tennessee. There are a number of different bird control options, and a array of suitable applications for each control method, which is why it is important to contact a Animal Pros specialist. Bird spikes can be effective in the right application, but is not suitable for all birds. Bird spikes are available in stainless steel spikes, metal, and plastic. Contact a Animal Pros specialist for an evaluation today. Problem Bird issues often result from these species of birds, and as some birds are protected under the Federal Migratory Bird Treaty Act, where removal or nest destruction can be prohibited without proper permits. Common bird problems are caused by these species. For technical support or assistance for all bird problems please call, as we offer bird problem solutions nationwide. Warehouse facilities and other storage and commercial buildings in greater Nashville and Middle Tennessee will often attract birds. Birds will utilize these structures from shelter from the elements, especially if bay and dock doors are left open. Unwanted bird problems in a warehouse can create hazardous conditions for the warehouse facility, and for the working environment. Animal Pros has the right solution to solve the problem for good. We offer immediate assistance for bird pest control, and provide consulting. Contact a Animal Pros bird control specialist today, for help removing problem birds. Birds in a vent, is the one problem that will effect every neighborhood in greater Nashville, Franklin, Brentwood, and Middle Tennessee. Every spring, starlings will wreak havoc in residential and commercial areas nesting in vents. 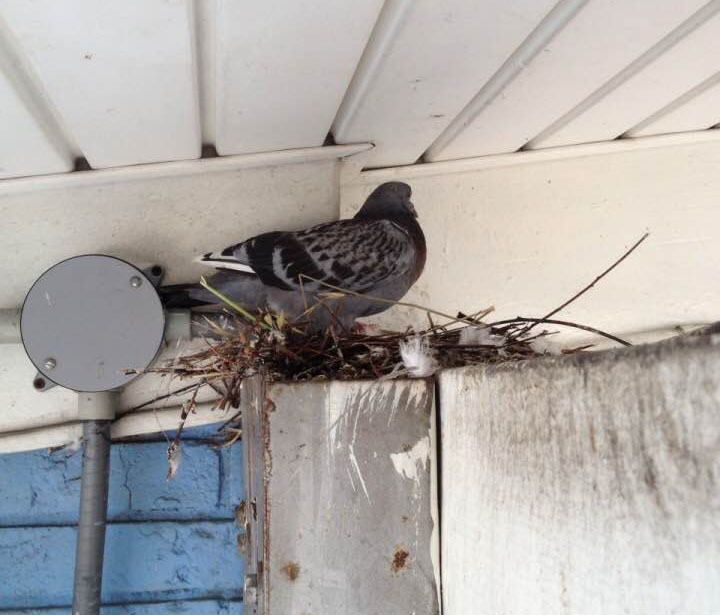 Bathroom Vents and Dryer Vents are the most common vents on a home or building that birds are able to breech. Once a bird has access into a vent, they will bring in nesting material, as bird droppings will quickly accumulate, causing major problems. Contact an Animal Pros specialist today for help removing birds from your vents. Aviation and Military facilities often attract birds in hangars and on runways, because of the view over large expansive areas, and the numerous structures with bay and dock doors. These areas provide shelter from the elements and protection from predators, but create a serious health and safety risk to the public, workers, working environment, equipment, and machines. Bird droppings or nesting on planes and helicopters is costly to clean. Bird strikes, pose a real threat, as it likely happens within close proximity to the airport. Contact a Animal Pros specialist for bird reduction programs or for bird deterrent installation. We offer solutions that will effectively solve bird problems for good. Birds can be a real problem for commercial businesses. roosting, nesting, and droppings can be a health hazard in or around any commercial property. 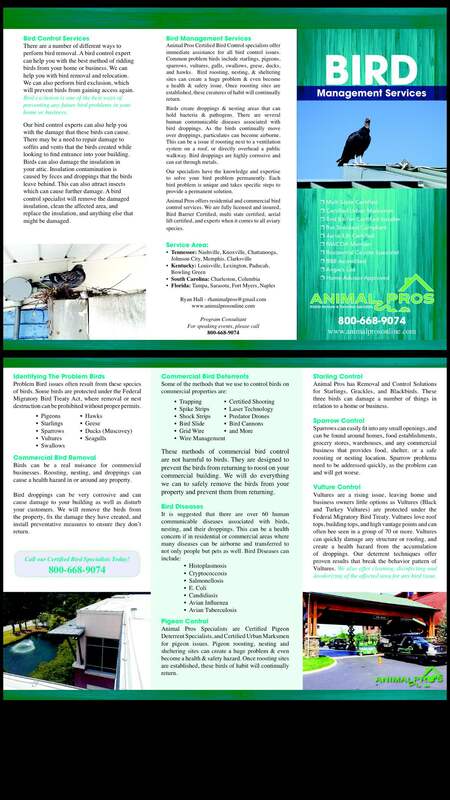 Animal Pros commercial bird management specialists are the ones to call. Birds can be an eyesore as they leave droppings. These bird droppings can be very corrosive and can cause damage to your building. 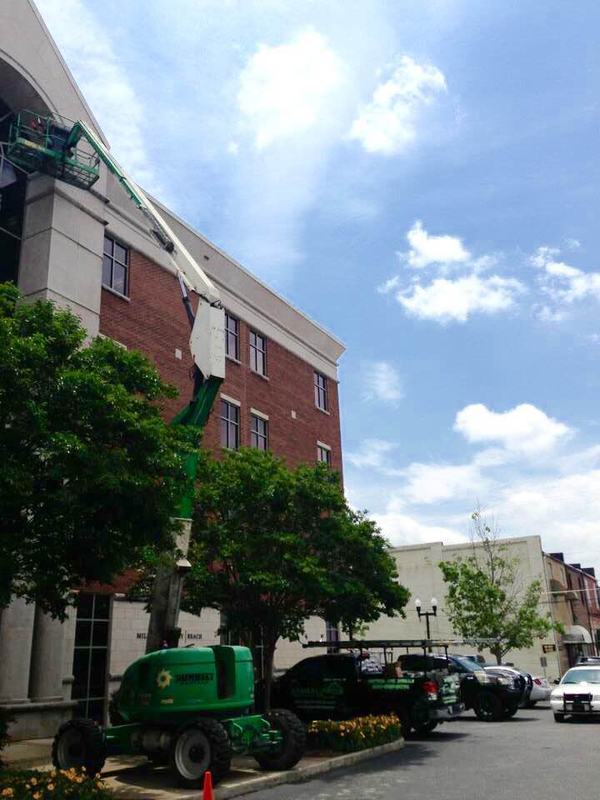 Animal Pros can help you with your commercial bird removal problems in the Nashville, SC area. We can offer solutions on bird removal and bird proofing. Birds on your commercial property can lead to upset customers, damage to the building, and health hazards. We will remove the birds from the property, fix the damage they have created, and install preventative measures to ensure they don’t return. When it comes to birds, there may be way more to worry about than just the bird itself. It is suggested that there are over 60 human communicable diseases associated with birds, nesting, and their droppings. Problems can be a health concern if in residential or commercial areas where many diseases can be airborne and transferred to not only people but pets as well. In addition to diseases, birds can be carriers to ectoparasites, as there are over 50 ectoparaites they can carry. Ectoparasites come in on the host bird, and can quickly start spreading throughout the structure in search of a host. Common Ectoparasites include: Bird Mites, Fleas, Ticks, Bed Bugs, and even West Nile from a mosquito that has bitten a infected bird. These methods are not designed to harm the birds. 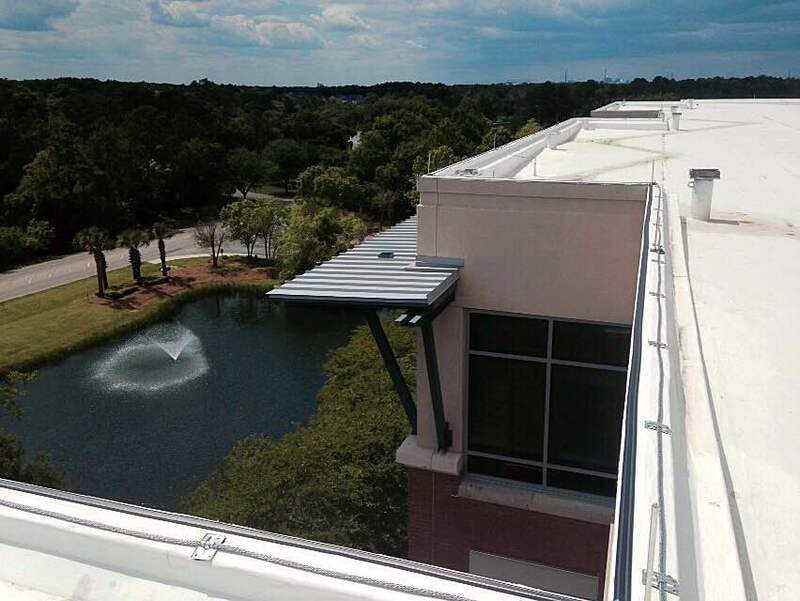 They are designed to prevent the birds from returning to roost on your commercial building. We will do everything we can to safely remove the birds from your property and prevent them from returning. Question? : I Like to feed Birds, but notice some birds appearing sick. Any Suggestions? (1) Avoid Crowding – Provide enough space or multiple feeders as a single feeder is key in spreading disease. (2) Clean Wastes – Cleaning up excess food and bird droppings can make your feeder more safe. Clean and disinfect feeders regularly to cut down on spreading disease. (3) Fresh Seed – Discarding old or wet seed, and only using fresh seed. (4) Wildlife Attracting – Understanding that many critters and other animals will all be attracted to bird seed. If using feeders, understand that it will attract other animals in the area, and in close proximity of your home. (5) Prevent Contamination – If rodents happen to find stored seed, throw it away. Rodents can carry a number of diseases, that can be spread. Question? : I noticed Birds in my Bathroom Vent, and we waited till the birds were big enough to fly away, but now in that bathroom notice little bugs that are barely visible covering the walls everywhere. What is causing the bug problem, and does it have anything to do with the birds? Answer: The Species of Bird you had in your Bathroom Exhaust Vent was a Starling. While waiting for the birds to fly away is ok, and covering the vent, i bet you left the nesting. Starlings are known for carrying ectoparisites, and in your case bird mites, is what you are seeing. the Host is gone, and now they are searching for a new host. Any nesting left where the birds were will have to be removed and depending on how bad the situation is, bird mites treated. Question? : I am a Commercial Contractor working on a large strip mall, and we used a wildlife company to install spikes where we were seeing birds roost. Now the birds are building nests on the spikes! Can you help us? Answer: The most common mistakes made during bird jobs by wildlife operators is using deterrents or spikes for the wrong species of birds. If the birds are building nests on the spikes, then you are having Sparrow problems, and the solution should be a different deterrent like electric shock track. We are certified installers for bird deterrents, so please call for immediate assistance.